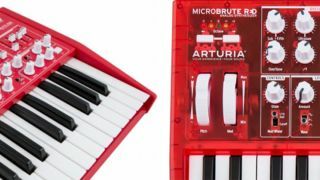 According to Sweetwater, Arturia has announced two limited editions of the hugely popular Minibrute and Microbrute monosynths. However, there has been no official word from the French manufacturer as yet. The US retail giant has posted both synths in their new limited edition livery. The Minibrute takes on a lovely solid crimson hue, whereas the Microbrute gets a translucent red case. Both machines look to be sharing the same specs as the originals with no extras included, unlike the Microbrute SE which featured stackable cables. For more information on both synths (soon, we hope), head on over to the Arturia website.